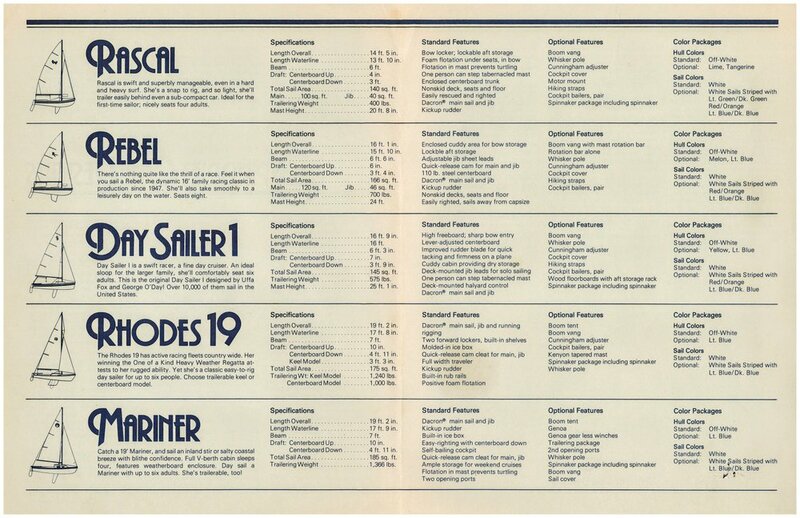 1981 Spindrift Mariner Ad — O'Day Mariner #1922 "Orion"
This rare 1981 advertisement is from Spindrift One Designs, a division of Rebel Industries, Inc., the company that bought the Mariner molds from O'Day when they discontinued production in 1979. Rebel, initially enthusiastic about the prospect of building the Mariner, built only a handful of them before dropping it two years later in favor of a recently acquired 22' trailerable sailboat with "tremendous potential". Enter Stuart Marine shortly thereafter. Notice that Spindrift added an extra portlight light on either side of the cabin; otherwise, the one-design aspect remained very much the same.